Whether you’re running errands in Centennial or navigating the snowy streets of Aurora, a new MDX is a good bet for your next SUV. Even the critics agree. So experience what the critics think by exploring Mile High Acura’s selection of MDX models today. Scores 26 Highway MPG and 19 City MPG! This Acura MDX delivers a Premium Unleaded V-6 3.5 L/212 engine powering this Automatic transmission. Window Grid Antenna, Wheels: 18 x 8 Pewter Gray Metallic 5-Spoke -inc: Machine-Finished, Vehicle Stability Assist Electronic Stability Control (ESC). *This Acura MDX Comes Equipped with These Options *Valet Function, Trunk/Hatch Auto-Latch, Trip Computer, Transmission: 9-Speed Automatic -inc: Sequential SportShift w/paddle shifters, 3-mode integrated dynamics system, Electronic Gear Selector and hill start assist, Tires: P245/60R18 High Performance AS, Tire Specific Low Tire Pressure Warning, Tailgate/Rear Door Lock Included w/Power Door Locks, Systems Monitor, Strut Front Suspension w/Coil Springs, Speed Sensitive Variable Intermittent Wipers. * Visit Us Today *A short visit to Mile High Acura - Denver located at 2799 South Havana, Denver, CO 80014 can get you a dependable MDX today! Delivers 26 Highway MPG and 19 City MPG! This Acura MDX boasts a Premium Unleaded V-6 3.5 L/212 engine powering this Automatic transmission. Window Grid Antenna, Wheels: 18 x 8 Pewter Gray Metallic 5-Spoke -inc: Machine-Finished, Vehicle Stability Assist Electronic Stability Control (ESC). * This Acura MDX Features the Following Options *Valet Function, Trunk/Hatch Auto-Latch, Trip Computer, Transmission: 9-Speed Automatic -inc: Sequential SportShift w/paddle shifters, 3-mode integrated dynamics system, Electronic Gear Selector and hill start assist, Tires: P245/60R18 High Performance AS, Tire Specific Low Tire Pressure Warning, Tailgate/Rear Door Lock Included w/Power Door Locks, Systems Monitor, Strut Front Suspension w/Coil Springs, Speed Sensitive Variable Intermittent Wipers. * Stop By Today *A short visit to Mile High Acura - Denver located at 2799 South Havana, Denver, CO 80014 can get you a dependable MDX today! Scores 26 Highway MPG and 19 City MPG! This Acura MDX boasts a Premium Unleaded V-6 3.5 L/212 engine powering this Automatic transmission. Window Grid Antenna, Wheels: 18 x 8 Pewter Gray Metallic 5-Spoke -inc: Machine-Finished, Vehicle Stability Assist Electronic Stability Control (ESC). *This Acura MDX Comes Equipped with These Options *Valet Function, Trunk/Hatch Auto-Latch, Trip Computer, Transmission: 9-Speed Automatic -inc: Sequential SportShift w/paddle shifters, 3-mode integrated dynamics system, Electronic Gear Selector and hill start assist, Tires: P245/60R18 High Performance AS, Tire Specific Low Tire Pressure Warning, Tailgate/Rear Door Lock Included w/Power Door Locks, Systems Monitor, Strut Front Suspension w/Coil Springs, Speed Sensitive Variable Intermittent Wipers. * Stop By Today *For a must-own Acura MDX come see us at Mile High Acura - Denver, 2799 South Havana, Denver, CO 80014. Just minutes away! Delivers 26 Highway MPG and 18 City MPG! This Acura MDX delivers a Premium Unleaded V-6 3.5 L/212 engine powering this Automatic transmission. Window Grid Antenna, Wheels: 20 x 8 Pewter Gray Metallic 10-Spoke -inc: Machine-Finished, Wheels w/Machined w/Painted Accents Accents. * This Acura MDX Features the Following Options *Vehicle Stability Assist Electronic Stability Control (ESC), Valet Function, Trunk/Hatch Auto-Latch, Trip Computer, Transmission: 9-Speed Automatic -inc: Sequential SportShift w/paddle shifters, 3-mode integrated dynamics system, Electronic Gear Selector and hill start assist, Tracker System, Towing w/Trailer Sway Control, Tires: P245/50R20 High Performance AS, Tire Specific Low Tire Pressure Warning, Tailgate/Rear Door Lock Included w/Power Door Locks. * Visit Us Today *Test drive this must-see, must-drive, must-own beauty today at Mile High Acura - Denver, 2799 South Havana, Denver, CO 80014. Scores 26 Highway MPG and 19 City MPG! This Acura MDX boasts a Premium Unleaded V-6 3.5 L/212 engine powering this Automatic transmission. Window Grid Antenna, Wheels: 20 x 8 Shark Gray Twisted 10-Spoke -inc: Machine-Finished, Voice Activated Multi Zone Auto-Climate Control Air Conditioning w/Gps Linked. *This Acura MDX Comes Equipped with These Options *Vehicle Stability Assist Electronic Stability Control (ESC), Valet Function, Trunk/Hatch Auto-Latch, Trip Computer, Transmission: 9-Speed Automatic -inc: Sequential SportShift w/paddle shifters, 3-mode integrated dynamics system, Electronic Gear Selector and hill start assist, Tracker System, Tires: P245/50R20 High Performance AS, Tire Specific Low Tire Pressure Warning, Tailgate/Rear Door Lock Included w/Power Door Locks, Systems Monitor. * Stop By Today *A short visit to Mile High Acura - Denver located at 2799 South Havana, Denver, CO 80014 can get you a reliable MDX today! Delivers 26 Highway MPG and 19 City MPG! This Acura MDX boasts a Premium Unleaded V-6 3.5 L/212 engine powering this Automatic transmission. Window Grid Antenna, Wheels: 20 x 8 Shark Gray Twisted 10-Spoke -inc: Machine-Finished, Voice Activated Multi Zone Auto-Climate Control Air Conditioning w/Gps Linked. * This Acura MDX Features the Following Options *Vehicle Stability Assist Electronic Stability Control (ESC), Valet Function, Trunk/Hatch Auto-Latch, Trip Computer, Transmission: 9-Speed Automatic -inc: Sequential SportShift w/paddle shifters, 3-mode integrated dynamics system, Electronic Gear Selector and hill start assist, Tracker System, Tires: P245/50R20 High Performance AS, Tire Specific Low Tire Pressure Warning, Tailgate/Rear Door Lock Included w/Power Door Locks, Systems Monitor. * Visit Us Today *For a must-own Acura MDX come see us at Mile High Acura - Denver, 2799 South Havana, Denver, CO 80014. Just minutes away! Delivers 26 Highway MPG and 19 City MPG! This Acura MDX boasts a Premium Unleaded V-6 3.5 L/212 engine powering this Automatic transmission. Window Grid Antenna, Wheels: 20 x 8 Shark Gray Twisted 10-Spoke -inc: Machine-Finished, Voice Activated Multi Zone Auto-Climate Control Air Conditioning w/Gps Linked. *This Acura MDX Comes Equipped with These Options *Vehicle Stability Assist Electronic Stability Control (ESC), Valet Function, Trunk/Hatch Auto-Latch, Trip Computer, Transmission: 9-Speed Automatic -inc: Sequential SportShift w/paddle shifters, 3-mode integrated dynamics system, Electronic Gear Selector and hill start assist, Tracker System, Tires: P245/50R20 High Performance AS, Tire Specific Low Tire Pressure Warning, Tailgate/Rear Door Lock Included w/Power Door Locks, Systems Monitor. * Stop By Today *Stop by Mile High Acura - Denver located at 2799 South Havana, Denver, CO 80014 for a quick visit and a great vehicle! Boasts 26 Highway MPG and 19 City MPG! This Acura MDX delivers a Premium Unleaded V-6 3.5 L/212 engine powering this Automatic transmission. Window Grid Antenna, Wheels: 20 x 8 Shark Gray Twisted 10-Spoke -inc: Machine-Finished, Voice Activated Multi Zone Auto-Climate Control Air Conditioning w/Gps Linked. *This Acura MDX Comes Equipped with These Options *Vehicle Stability Assist Electronic Stability Control (ESC), Valet Function, Trunk/Hatch Auto-Latch, Trip Computer, Transmission: 9-Speed Automatic -inc: Sequential SportShift w/paddle shifters, 3-mode integrated dynamics system, Electronic Gear Selector and hill start assist, Tracker System, Tires: P245/50R20 High Performance AS, Tire Specific Low Tire Pressure Warning, Tailgate/Rear Door Lock Included w/Power Door Locks, Systems Monitor. * Stop By Today *Come in for a quick visit at Mile High Acura - Denver, 2799 South Havana, Denver, CO 80014 to claim your Acura MDX! Boasts 26 Highway MPG and 19 City MPG! This Acura MDX delivers a Premium Unleaded V-6 3.5 L/212 engine powering this Automatic transmission. Window Grid Antenna, Wheels: 20 x 8 Shark Gray Twisted 10-Spoke -inc: Machine-Finished, Voice Activated Multi Zone Auto-Climate Control Air Conditioning w/Gps Linked. * This Acura MDX Features the Following Options *Vehicle Stability Assist Electronic Stability Control (ESC), Valet Function, Trunk/Hatch Auto-Latch, Trip Computer, Transmission: 9-Speed Automatic -inc: Sequential SportShift w/paddle shifters, 3-mode integrated dynamics system, Electronic Gear Selector and hill start assist, Tracker System, Tires: P245/50R20 High Performance AS, Tire Specific Low Tire Pressure Warning, Tailgate/Rear Door Lock Included w/Power Door Locks, Systems Monitor. * Visit Us Today *A short visit to Mile High Acura - Denver located at 2799 South Havana, Denver, CO 80014 can get you a dependable MDX today! Boasts 27 Highway MPG and 26 City MPG! This Acura MDX boasts a Gas/Electric V-6 3.0 L/183 engine powering this Automatic transmission. Window Grid Antenna, Wheels: 20 x 8 Shark Gray Twisted 10-Spoke -inc: Machine-Finished, Vehicle Stability Assist Electronic Stability Control (ESC). *This Acura MDX Comes Equipped with These Options *Valet Function, Trunk/Hatch Auto-Latch, Trip Computer, Transmission: 7-Speed Dual-Clutch -inc: electronic gear selector, sequential SportShift paddle-shifters and 4-mode Integrated Dynamics System (IDS)(Comfort, Normal, Sport, Sport +), Tires: 245/50R20 High Performance AS, Tire Specific Low Tire Pressure Warning, Tailgate/Rear Door Lock Included w/Power Door Locks, Systems Monitor, Strut Front Suspension w/Coil Springs, Speed Sensitive Rain Detecting Variable Intermittent Wipers. * Stop By Today *For a must-own Acura MDX come see us at Mile High Acura - Denver, 2799 South Havana, Denver, CO 80014. Just minutes away! Boasts 25 Highway MPG and 19 City MPG! This Acura MDX delivers a Premium Unleaded V-6 3.5 L/212 engine powering this Automatic transmission. Window Grid Antenna, Wheels: 20 x 8.5 Shark Gray Split 5-Spoke, Voice Activated Multi Zone Auto-Climate Control Air Conditioning w/Gps Linked. * This Acura MDX Features the Following Options *Vehicle Stability Assist Electronic Stability Control (ESC), Valet Function, Trunk/Hatch Auto-Latch, Trip Computer, Transmission: 9-Speed Automatic -inc: Sequential SportShift w/paddle shifters, 3-mode integrated dynamics system, Electronic Gear Selector and hill start assist, Tracker System, Tires: P265/45R20 High Performance AS, Tire Specific Low Tire Pressure Warning, Tailgate/Rear Door Lock Included w/Power Door Locks, Systems Monitor. * Stop By Today *Come in for a quick visit at Mile High Acura - Denver, 2799 South Havana, Denver, CO 80014 to claim your Acura MDX! Boasts 26 Highway MPG and 19 City MPG! This Acura MDX delivers a Premium Unleaded V-6 3.5 L/212 engine powering this Automatic transmission. Window Grid Antenna, Wheels: 20 x 8.5 Shark Gray Split 5-Spoke -inc: Machine-Finished, Voice Activated Multi Zone Auto-Climate Control Air Conditioning w/Gps Linked. * This Acura MDX Features the Following Options *Vehicle Stability Assist Electronic Stability Control (ESC), Valet Function, Trunk/Hatch Auto-Latch, Trip Computer, Transmission: 9-Speed Automatic -inc: Sequential SportShift w/paddle shifters, 3-mode integrated dynamics system, Electronic Gear Selector and hill start assist, Tracker System, Tires: P265/45R20 High Performance AS, Tire Specific Low Tire Pressure Warning, Tailgate/Rear Door Lock Included w/Power Door Locks, Systems Monitor. * Visit Us Today *Stop by Mile High Acura - Denver located at 2799 South Havana, Denver, CO 80014 for a quick visit and a great vehicle! Delivers 26 Highway MPG and 19 City MPG! This Acura MDX delivers a Premium Unleaded V-6 3.5 L/212 engine powering this Automatic transmission. Window Grid Antenna, Wheels: 20 x 8.5 Shark Gray Split 5-Spoke -inc: Machine-Finished, Voice Activated Multi Zone Auto-Climate Control Air Conditioning w/Gps Linked. *This Acura MDX Comes Equipped with These Options *Vehicle Stability Assist Electronic Stability Control (ESC), Valet Function, Trunk/Hatch Auto-Latch, Trip Computer, Transmission: 9-Speed Automatic -inc: Sequential SportShift w/paddle shifters, 3-mode integrated dynamics system, Electronic Gear Selector and hill start assist, Tracker System, Tires: P265/45R20 High Performance AS, Tire Specific Low Tire Pressure Warning, Tailgate/Rear Door Lock Included w/Power Door Locks, Systems Monitor. * Visit Us Today *Test drive this must-see, must-drive, must-own beauty today at Mile High Acura - Denver, 2799 South Havana, Denver, CO 80014. Delivers 26 Highway MPG and 19 City MPG! This Acura MDX delivers a Premium Unleaded V-6 3.5 L/212 engine powering this Automatic transmission. Window Grid Antenna, Wheels: 20 x 8.5 Shark Gray Split 5-Spoke -inc: Machine-Finished, Voice Activated Multi Zone Auto-Climate Control Air Conditioning w/Gps Linked. *This Acura MDX Comes Equipped with These Options *Vehicle Stability Assist Electronic Stability Control (ESC), Valet Function, Trunk/Hatch Auto-Latch, Trip Computer, Transmission: 9-Speed Automatic -inc: Sequential SportShift w/paddle shifters, 3-mode integrated dynamics system, Electronic Gear Selector and hill start assist, Tracker System, Tires: P265/45R20 High Performance AS, Tire Specific Low Tire Pressure Warning, Tailgate/Rear Door Lock Included w/Power Door Locks, Systems Monitor. * Stop By Today *Stop by Mile High Acura - Denver located at 2799 South Havana, Denver, CO 80014 for a quick visit and a great vehicle! Delivers 26 Highway MPG and 19 City MPG! This Acura MDX boasts a Premium Unleaded V-6 3.5 L/212 engine powering this Automatic transmission. Window Grid Antenna, Wheels: 20 x 8.5 Shark Gray Split 5-Spoke -inc: Machine-Finished, Voice Activated Multi Zone Auto-Climate Control Air Conditioning w/Gps Linked. * This Acura MDX Features the Following Options *Vehicle Stability Assist Electronic Stability Control (ESC), Valet Function, Trunk/Hatch Auto-Latch, Trip Computer, Transmission: 9-Speed Automatic -inc: Sequential SportShift w/paddle shifters, 3-mode integrated dynamics system, Electronic Gear Selector and hill start assist, Tracker System, Tires: P265/45R20 High Performance AS, Tire Specific Low Tire Pressure Warning, Tailgate/Rear Door Lock Included w/Power Door Locks, Systems Monitor. * Stop By Today *You've earned this- stop by Mile High Acura - Denver located at 2799 South Havana, Denver, CO 80014 to make this car yours today! Delivers 27 Highway MPG and 26 City MPG! This Acura MDX boasts a Gas/Electric V-6 3.0 L/183 engine powering this Automatic transmission. Window Grid Antenna, Wheels: 20 x 8 Shark Gray Twisted Split 5-Spoke -inc: Machine-finished, Vehicle Stability Assist Electronic Stability Control (ESC). * This Acura MDX Features the Following Options *Valet Function, Trunk/Hatch Auto-Latch, Trip Computer, Transmission: 7-Speed Dual-Clutch -inc: electronic gear selector, sequential SportShift paddle-shifters and 4-mode Integrated Dynamics System (IDS)(Comfort, Normal, Sport, Sport +), Tires: 245/50R20 High Performance AS, Tire Specific Low Tire Pressure Warning, Tailgate/Rear Door Lock Included w/Power Door Locks, Systems Monitor, Surround View Back-Up Camera, Strut Front Suspension w/Coil Springs. * Stop By Today *Live a little- stop by Mile High Acura - Denver located at 2799 South Havana, Denver, CO 80014 to make this car yours today! Delivers 27 Highway MPG and 26 City MPG! This Acura MDX boasts a Gas/Electric V-6 3.0 L/183 engine powering this Automatic transmission. Window Grid Antenna, Wheels: 20 x 8 Shark Gray Twisted Split 5-Spoke -inc: Machine-finished, Vehicle Stability Assist Electronic Stability Control (ESC). *This Acura MDX Comes Equipped with These Options *Valet Function, Trunk/Hatch Auto-Latch, Trip Computer, Transmission: 7-Speed Dual-Clutch -inc: electronic gear selector, sequential SportShift paddle-shifters and 4-mode Integrated Dynamics System (IDS)(Comfort, Normal, Sport, Sport +), Tires: 245/50R20 High Performance AS, Tire Specific Low Tire Pressure Warning, Tailgate/Rear Door Lock Included w/Power Door Locks, Systems Monitor, Surround View Back-Up Camera, Strut Front Suspension w/Coil Springs. * Visit Us Today *Come in for a quick visit at Mile High Acura - Denver, 2799 South Havana, Denver, CO 80014 to claim your Acura MDX! Why Buy a New Acura MDX from Mile High Acura? 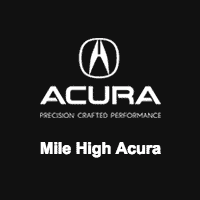 When you rely on Mile High Acura for your luxury vehicle needs, you’ll enjoy our years of experience serving customers in the Denver Metro area. We’re conveniently located at 2799 S. Havana St. in Denver, CO, and whether you’re looking for an Acura MDX lease or a low-interest auto loan, we can help. Give our customer service experts a call at 303-743-5193, or contact us from the convenience of your home with questions. Find out today why so many customers from Aurora have enjoyed an Easy Buy at Mile High.